Nearly six years after the African Union shut it out in the cold, Egypt will take the organisation’s helm — and strengthening multilateral powers is unlikely to be on the agenda. Cairo’s tenure “will probably concentrate on security and peacekeeping”, said Ashraf Swelam, who heads a think tank linked to the country’s foreign ministry. Incoming AU chair President Abdel Fattah Al-Sisi will likely focus less on “financial and administrative reform” than his predecessor, Swelam added. Such reform was the cornerstone of outgoing AU chairman Paul Kagame’s year in the role. The Rwandan president has pushed for a continent-wide import tax to fund the AU and reduce its dependence on external donors, who still pay for more than half the institution’s annual budget. An African diplomat told AFP that Egypt — along with fellow heavyweights South Africa and Nigeria — does not want a powerful AU. This diplomat, who has been tracking AU affairs for over a decade, said Cairo has “never forgotten” its suspension in 2013. The near year-long lockout from the AU came after Egypt’s army deposed Islamist president Mohamed Morsi, who in 2012 had become the country’s first democratically elected president. Sisi is due to take the helm at the AU’s biannual heads of the state assembly, which takes place on February 10 and 11 at the AU’s gleaming headquarters in Ethiopia’s capital Addis Ababa. As usual, the continent’s multiple security crises will be high on the VIPs’ agenda. Rwanda’s ambitious funding proposal will also likely be on the table. But it has met resistance not only from Egypt, but other member states, so may fail to pass. Reform of the AU Commission is an even more sensitive topic. In November 2018, most states rejected a proposal to give the head of the AU’s executive organ the power to name deputies and commissioners. But the Egyptians are “fully engaged” in pushing other AU reforms, according to an AU official. One key initiative backed by Cairo is the Continental Free Trade Area (CFTA), an initiative agreed by 44 of 55 member states in March 2018. The single market is a flagship of the AU’s “Agenda 2063” programme, conceived as a strategic framework for socioeconomic transformation. However, the trade pact has met resistance from South Africa. Sisi will, therefore, need to push hard for ratification of this accord, if it is to come into effect. For Elissa Jobson, head of Africa advocacy at the International Crisis Group, Sisi can be expected to “use the presidency to increase his country’s standing among other African states”. “This is not a departure from previous administrations”, particularly that of the outgoing chairman, she added. “Kagame showed that the presidency — for a long time considered to be merely a figurehead — can be used to promote national interests and boost a leader’s international profile,” Jobson said. The AU official — who requested anonymity — said Rwanda’s president will remain a point person for the organisation’s broad reform agenda, despite handing over the chair. But there are major limits to the power wielded by the post of AU chairman. Kagame suffered a crushing disavowal by the AU after expressing “serious doubts” about the results of Democratic Republic of Congo’s recent presidential election, which was officially won by Felix Tshisekedi. 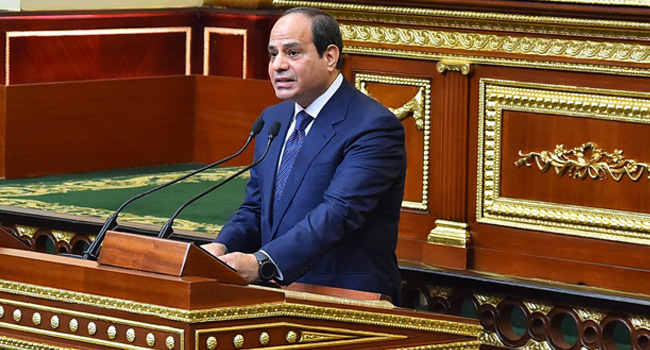 For Liesl Louw-Vaudran at the Institute of Security Studies, Sisi wants Egypt to be considered part of Africa, not just the Arab world — but that will require work. “North African countries have a reputation of looking in a different direction than Africa, and Egypt will have to overcome that stereotype,” she said. The AU’s theme for this summit is “Refugees, Returnees and Internally Displaced Persons” presented within a security context. Cairo is casting itself as a champion in the battle against illegal immigration — and as a model for hosting refugees on its soil. Will Oprah be the next celebrity president?